Smartphones in 2017 have been defined by devices with curvy form factors and ever-shrinking bezels. Razer’s first smartphone – simply called the Razer Phone – is having none of that. It’s a big, boxy, chunk of metal with the first 120Hz display on a smartphone and hearty bezels sporting the best speakers I’ve heard in the category. I found myself a little in love. Cautiously – Razer’s new to the business, after all – but still. Those in the know might remember Razer acquired Nextbit earlier this year to jumpstart its smartphone efforts. 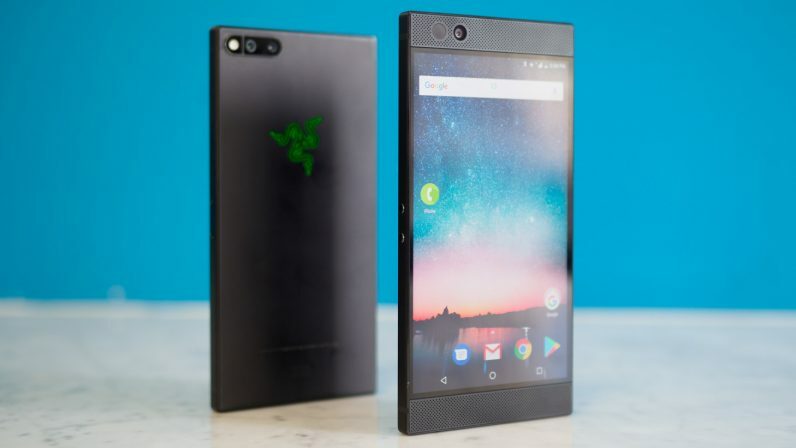 The Razer Phone is pretty much an exact marriage of the two companies’ design language: the boxiness of the Nextbit Robin and the stealthy dark metal of Razer devices. Considering the device’s emphasis on gaming and huge speakers, I don’t mind the large bezels, and the 16:9 aspect ratio assures there isn’t any weird letterboxing or compatibility issues in games. There’s a limited edition model with a neon green logo, but most people will be getting the model with a more palatable silver color. It’s nice to see a phone that doesn’t look like everything else on the market, and the flat shape helps ensure an easy grip. My favorite touch, however, is the fingerprint sensor in the power key. Fun fact: the phone is boxy enough you can stand it up vertically or on its side, which comes in handy for watching movies while your hands are occupied. It also made it a lot easier for me to take product photos, but I digress. 64 GB storage, microSD expansion. Naturally, the 120Hz display is the star of the show, and I noticed the added smoothness as soon as I picked it up. I’m particularly sensitive to refresh rates, but I think anyone will appreciate just how fluid navigating the UI feels. We’ll have to see how performance holds up in the long term – I saw a few dropped frames on the prototype I handled – but Razer might have just built the smoothest feeling phone I’ve ever used. The display itself seems pretty good. I pretty much always prefer OLED to LCD, but the IGZO panel is solid and worth it for the refresh rate implementation. There’s no word yet on whether the increased refresh rate will allow for Daydream VR compatibility, something usually reserved for AMOLED panels. Software-wise, the device is running a nearly stock Android skin, using Nova Launcher Prime instead of a sucky proprietary launcher. It’s disappointing Razer isn’t launching with Oreo, which is slated for early next year, but there are some useful additions. There’s a theming engine if Razer’s neon green look isn’t doing the trick, and you can adjust the max refresh rate from within settings. Bezel-less, this phone is not. There’s also Dolby Atmos on board, which combined with some massive speakers – just look at the size of those grilles – make for easily the best sounding smartphone audio I’ve heard. I was filling the small conference room we were testing the device in with volume set to about 60 percent. There was a remarkable amount of stereo separation, and even the bass had a bit of thump to it. The Pixel 2’s stereo speakers are decent, but doing a side-by-side comparison, they aren’t even in the same league. That said, I’m disappointed there’s no headphone jack in a device this chunky, but at least Razer says it’s provided a really good, THX-certified dongle. Of course, you won’t be able to charge it and listen to music at the same time, but with a 4,000 mAh battery, you probably won’t have to. Razer says the giant battery should enable marathon gaming sessions – seven hours of ‘Hearthstone’ in one charge, for instance. Meanwhile, QuickCharge 4.0+ means the battery will go from zero to 85 percent in an hour. We’ll have to see how the device holds up once we can spend more time with it, but right now Razer built a phone that actually differentiates itself with some unique, over-the-top specs. Better yet, it won’t burn your wallet, as Razer is pricing it pretty aggressively. It’ll cost $699 in the US, in a year where flagships generally cross the $800 mark. Pre-orders begin today and the device will be available on November 17 in North America and Europe.